Alzheimer’s disease affects more than 5 million persons in the U.S., and is projected to affect over 100 million persons worldwide by 2050. However, patients with dementia are frequently misdiagnosed, or undiagnosed, as to the cause of their symptoms. Diagnosis is even more difficult in milder stages. ADMdx is developing tools to support accurate diagnosis of Alzheimer’s disease and other dementias, helping physicians to provide patients and families with answers, pursue appropriate treatment, and avoid medications that could be harmful for certain dementias. ADMdx has developed software algorithms that use one or more brain images to detect patterns of activity and/or brain structure that reveal the type and stage of dementia, even prior to symptom onset. The software is designed to work with whatever type of image(s) that the patient may have available, such as an MRI scan and/or one or more PET scans. ADMdx’s software identifies the closest match or matches (in the case of co-morbid disease), disease stage, and likely rate of clinical worsening. The result is a comprehensive, contextual assessment that can be used with other clinical evaluation to provide the best diagnosis and care for the patient. Assessments require only an image(s) from one time point but can also be made over time. 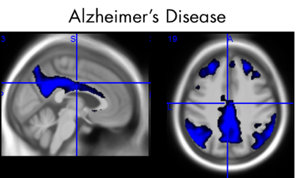 ADMdx has developed a unique diagnostic capability, enabled by highly sophisticated machine learning (pattern recognition) technology that has been trained to identify Alzheimer’s disease and other dementias. To support this, ADMdx has developed a proprietary database consisting of thousands of scans and associated clinical, demographic, genotype, laboratory data from public and private sources. Our clinical diagnostic product is currently in late-stage development, so it is currently for use in research and pharmaceutical trials only, with user feedback being gathered from physicians, patients, and their families.